When Rev. Dr. Martin Luther King, Jr. was assassinated 50 years ago, Columbia University responded as most other institutions did – with shock and grieving. 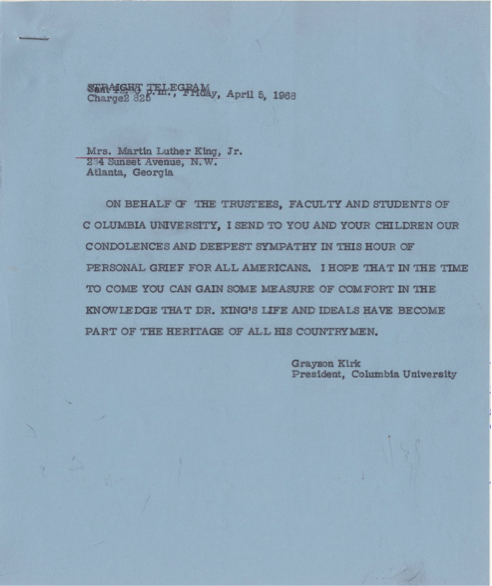 Flags were set to fly at half-mast until after Dr. King’s funeral and President Kirk sent a telegram on April 5, 1968 to Dr. King’s widow expressing condolences on behalf of the university community. A decision was also made to hold a campus memorial service in St. Paul’s Chapel at 3pm on April 9 – the day of the King funeral. Initially it was stated that the University would close starting at 3pm so all could attend the service. Then the administration received a letter dated April 6, 1968 from a group calling themselves “Concerned Black Students”. They argued that the University should close for the entire day on April 9 out of respect to Dr. King and what he stood for. The letter was hand-delivered to Columbia Security Desk in Low Library at 9:30pm on Saturday April 6 after they tried to give it to President Grayson Kirk at his residence. Their message was clearly received by administration the next morning. To see how this and the campus memorial service all played out, follow @1968CU on Twitter. 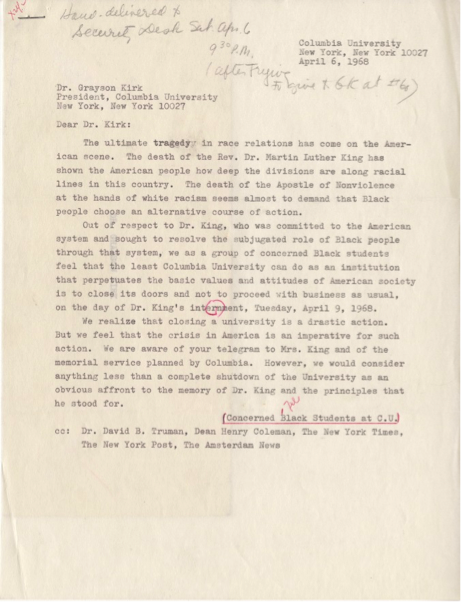 This entry was posted in Columbia University Archives and tagged Concerned Black Students, Kirk, Martin Luther King Jr, MLK, President Kirk on April 9, 2018 by Kimberly Springer. 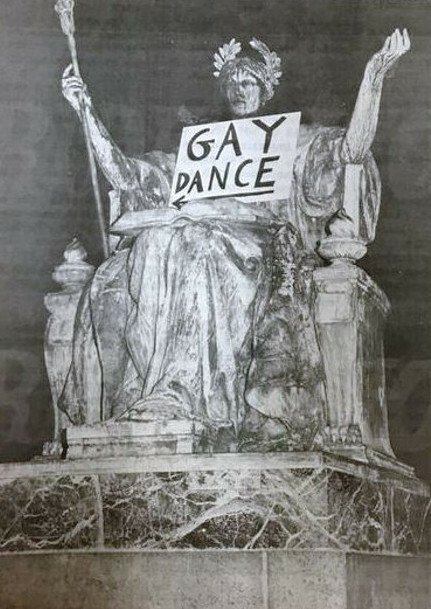 This week, Earl Hall at Columbia University was listed on the National Register of Historic Places, following its nomination by the NYC LGBT Historic Sites Project and in recognition of Earl Hall as a venue for meetings and dances of the Student Homophile League, the first gay student organization in the country. Professor Andrew Dolkart conducted some of his research here in the University Archives in support of the application. A sportising and betting tradition started on Staten Island by a barkeep, March Madness bracketology is upon us! 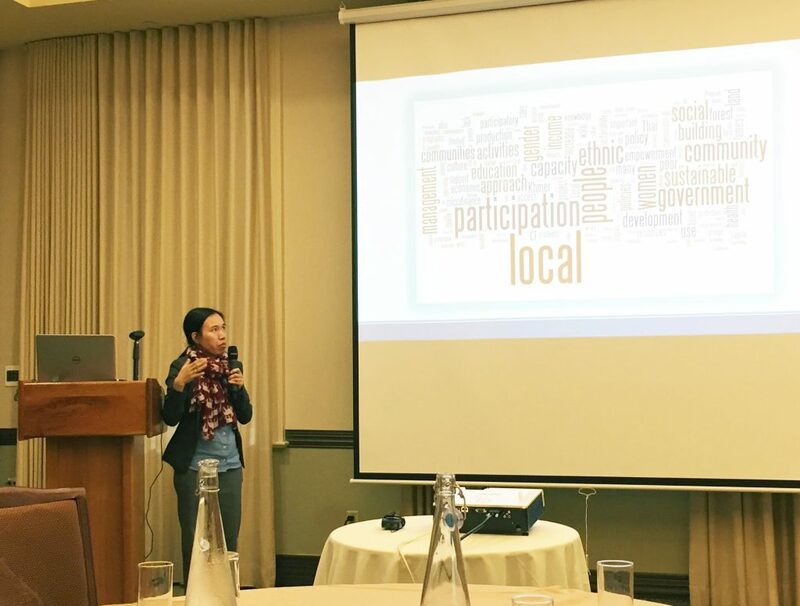 RBML Records Manager Joanna Rios shares key moments in a timely University Archives exhibition. The Columbia University Archives has on view a small exhibition marking the 50th anniversary of Columbia’s best men’s basketball team. 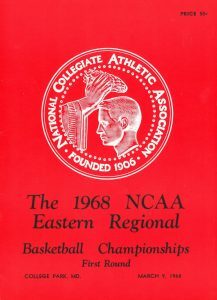 In 1967-1968, Columbia won 23 of 28 games, the most victories in school history, and finished the season ranked sixth in the nation. At the 1967 Holiday Festival, the most prestigious in-season tournament held at the World’s Most Famous Arena Madison Square Garden, the Columbia Varsity Basketball team defeated St. John’s to win their first and only Holiday Festival championship. This winter tournament victory was just the beginning. The Lions went on a 16-game winning streak (12 against Ivy League teams). They came into the last game of the season with the best record in Columbia’s history. 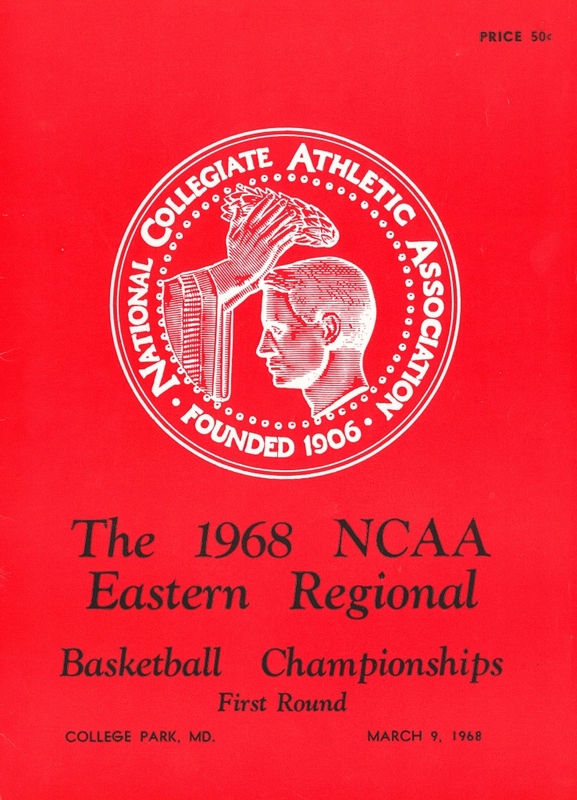 This entry was posted in Columbia University Archives and tagged basketball, Columbia Varsity Basketball, Dave Newark, Jim MacMillan, Lions, March Madness, NCAA, Princeton, sports, University Archives on March 15, 2018 by Kimberly Springer. 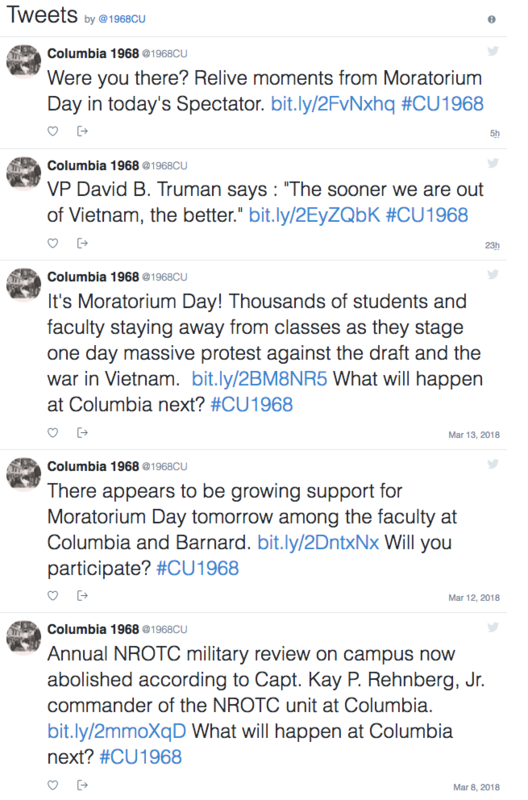 Our deep dive into the Columbia University Archives and the student unrest that lead to campus protest, building takeovers and critical questions about The Establishment continues on Twitter. 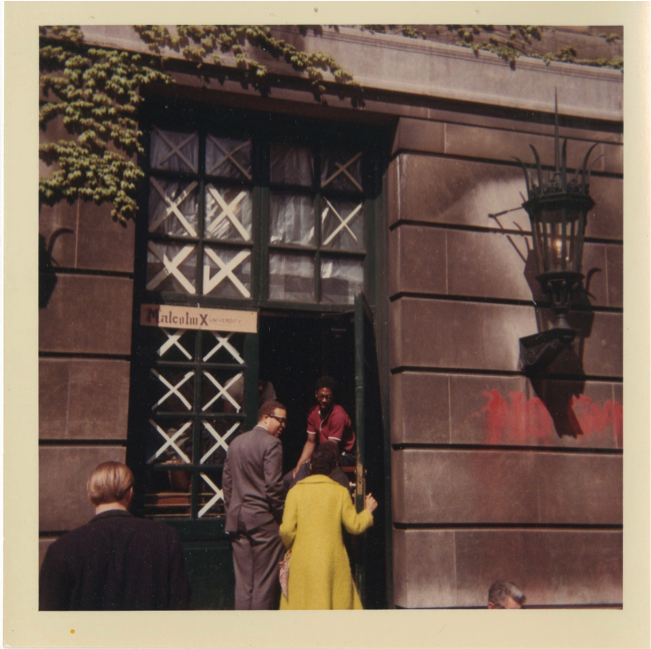 This entry was posted in American History Collections, Columbia University Archives on March 14, 2018 by Kimberly Springer. Join the Rare Book & Manuscript Library on this intro to the people, places and event that lead to the Columbia Crisis of 1968 and its aftermath. Start tour. This entry was posted in American History Collections, Columbia University Archives, Uncategorized on March 7, 2018 by Kimberly Springer. What were the main ingredients in recipes from 1902-1904? 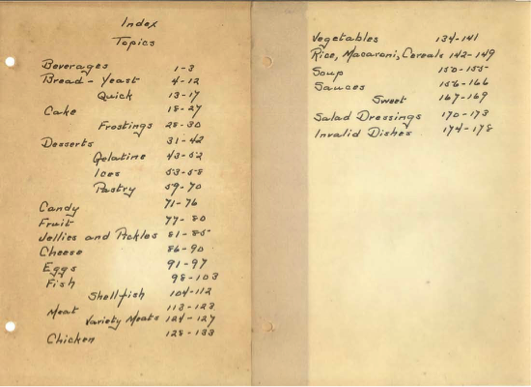 Among the recent additions to the University Archives is a fascinating recipe book put together by Clara Schauffler (1879-1972) from her time as a student in domestic science at Teachers College from September 1902 to June 1904. 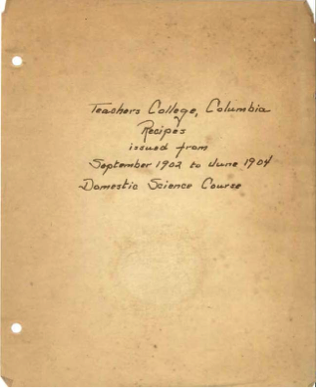 Clara Elizabeth Schauffler created a recipe book from the domestic science courses she took at Teachers College from September 1902 to June 1904. 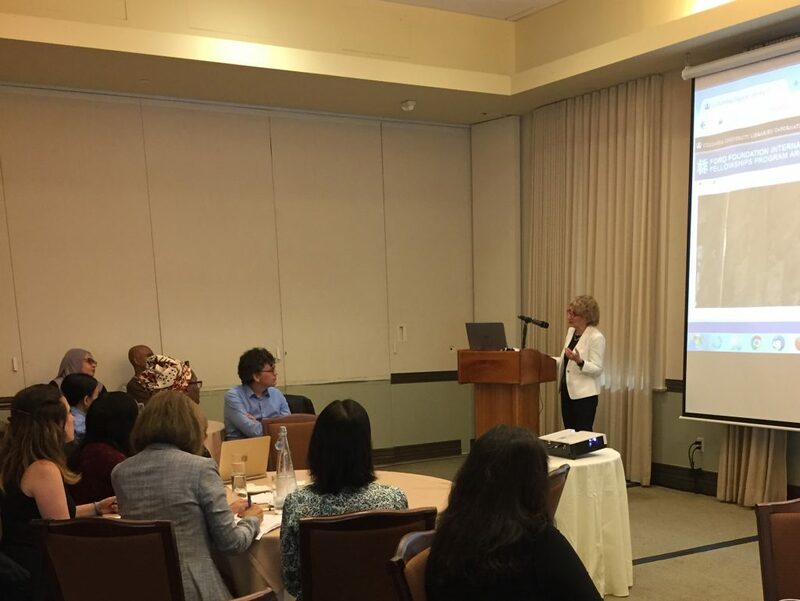 As a student pursuing the then-new two-year curriculum in domestic science, Schauffler took DS 10, Foods and DS 11, Foods, Advanced Course with Professor Helen Kinne and Mrs. Mary Forrest. Schauffler organized the class materials, the typed handouts with her corrections in pencil, and created this recipe book by pasting the recipes onto paper and placing them in a small, three-ring binder. She was very organized. The recipe book is arranged by topic and then alphabetically: Beverages; Bread; Cake; Desserts; Candy; Fruit; Jellies and Pickles; Cheese; Eggs; Fish (including shell fish); Meat (including Variety Meats and Chicken); Vegetables; Rice, Macaroni, Cereals; Soup; Sauces (including sweet sauces); Salad Dressings, and Invalid Dishes. After the table of contents, there is an alphabetical recipe title index, from Almond Hardbake to Yeast Breads. This entry was posted in Columbia University Archives and tagged Clara Schauffler, cookbook, cooking, recipes, University Archives on January 30, 2018 by Kimberly Springer. It’s been nearly 100 years since the infamous 1918 influenza epidemic swept the globe. As we’re in the middle of our own flu season you might be wondering how Columbia fared during that time. While millions of people were dying around the world from this relentless scourge, the students at Columbia University (most of whom were involved in the Student Army Training Corps which essentially took over the campus in the autumn of 1918) were kept remarkably healthy. 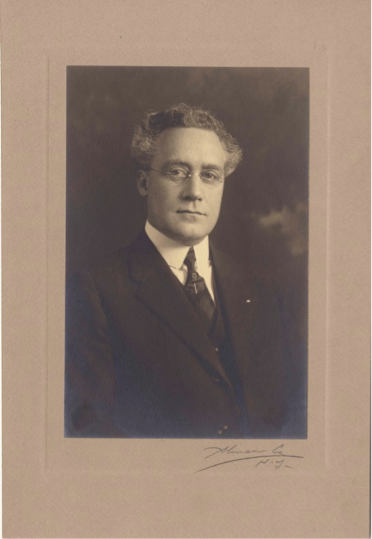 Dr. William H. McCastline was Columbia’s Medical Director. 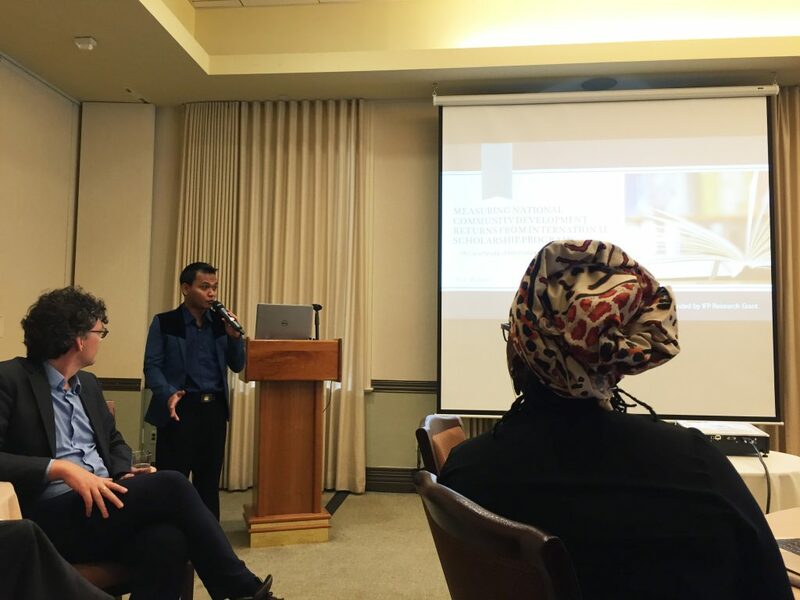 He was faced with a reported 200 cases of flu and 48 cases of pneumonia. This entry was posted in Columbia University Archives and tagged 1918 influenza epidemic, Columbia University, Dr. William McCastline, influenza on January 29, 2018 by Kimberly Springer. We were correct to assume that Columbia’s location in Manhattan allowed narrators potential access to public queer worlds, but the ways that the narrators choose to access these worlds were different than we guessed in our blueprint..What was most significant in terms of linking the interviews, however, were themes of community and its inverse, isolation. Narrators spoke with such great care and love about their mentors, their peers, and their friends. They were often in awe and pride of the people that they met during their Columbia years who led them into careers, relationships, and full and fulfilling lives. This entry was posted in Columbia University Archives, Uncategorized and tagged Columbia University, gay, lesbian, LGBT, LGBTQ, queer on January 3, 2018 by Kimberly Springer. 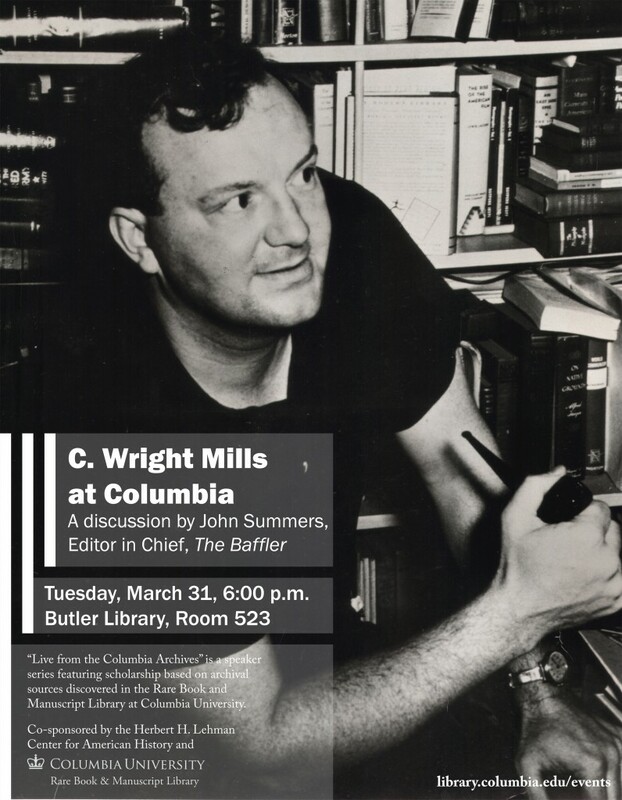 This entry was posted in American History Collections, Columbia University Archives, News & Events on March 24, 2015 by cl880.